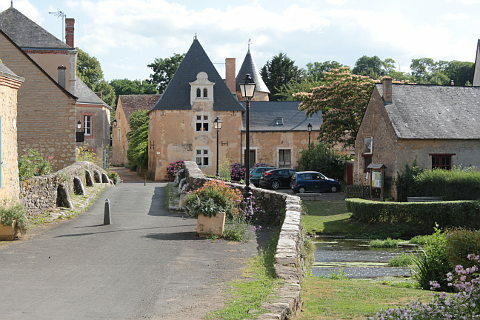 Asnieres-sur-Vegre is a small village on the Vegre river, about 35 kilometres south-west of Le Mans in the Sarthe department (Pays-de-la -Loire region). It is officially classified as a 'small city of character' and although it is small a visit is recommended when you are in this region. Your visit will start with a walk across the old bridge, with ancient origins although the current stone bridge is a 19th century rebuild of the older bridge. From this roman style stone bridge you have lovely views along the river and across to the village. You can also see the traditional communal village washhouse near here. 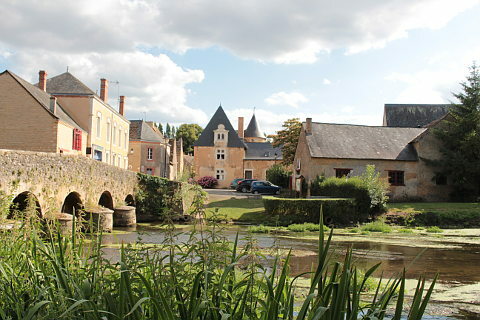 Places of interest are to found in both directions from the bridge, with Moulinvieux castle beyond the manors of Basse Cour and Arcis if you follow the Rue du Chateau from the northern end of the bridge. To the south of the bridge along Rue du 14 Nivose you head towards a building of particular note in Asnieres-sur-Vegre, the original Justice court for the town, known as the Manoir de la Cour, and an impressive structure dating in part from the 13th century. It is now a museum containing items relating to the middle ages. It also has a cafe. On the way to the Manoir de la Cour is another manor house called the Pavillon, which also has a cafe in the gardens next to the old stone tower of the manor house. 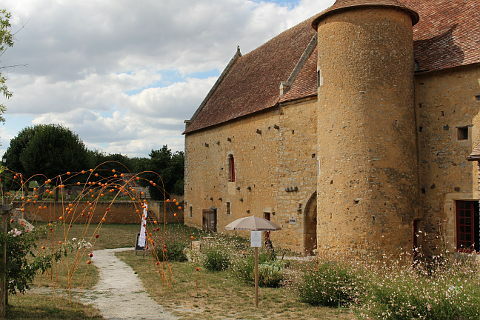 Depending which route you have followed through the old streets your next stop will perhaps be at the Church of Saint-Hilaire, near Asnières-sur-Vègre Tourist Information Office. The nave of the church is of roman style and was built in the 11th century and the choir section, in gothic style, is a little more recent having been added in the 16th century. 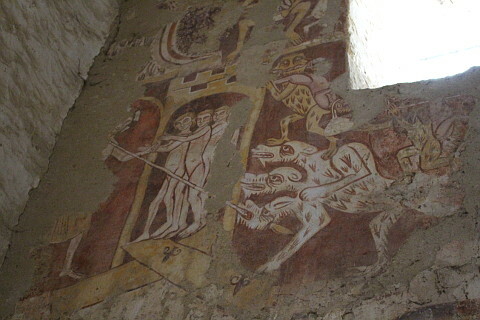 The highlight of the church is the large number of medieval frescoes that adorn the interior walls, painted between the 11th and 16th centuries and depicting stories and events from the Old Testament. 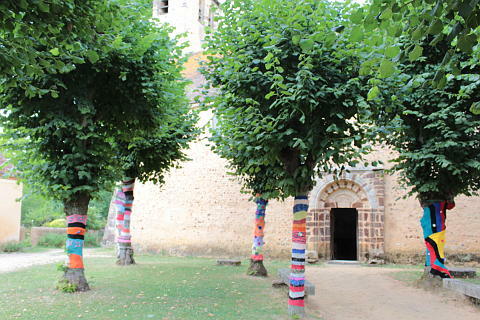 The trees outside the church had been "yarn-bombed" during our visit in July and were looking very colourful! 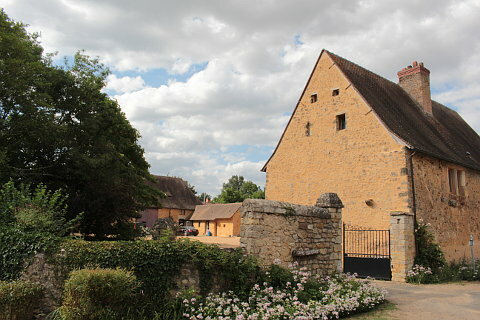 You can also see several imposing manor houses in and around Asnieres-sur-Vegre, such as Moulinvieux castle and the manors of Tannerie and Claies. After exploring the village, garden enthusiasts will enjoy a visit to the Mosaic Garden - the 'Jardin Mosaïque'. Covering an extensive 2.5 hectares (6 acres) the paths through the garden pass a very wide range of flowers and a section dedicated to ancient varieties of roses. The garden is grown on the basis of ecological principles with a focus on encouraging wildlife. The garden came 6th in the 2013 edition of the "Jardin Préféré des Français" or "favourite garden of the French" in a competition run by the France 2 tv channel. Although late spring is the best time to enjoy the flowers, the garden has a great deal of interest to visitors even in the autumn. The Jardin Mosaique is to the west of Asnieres: follow Rue Saint-Hilaire and then Le Cimetiere. 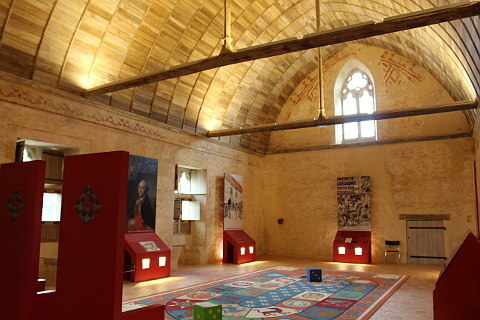 We also suggest that you visit Solesmes to the south-west of Asnieres-sur-Vegre, above all to attend a service in the abey, well known for its gregorian chant. 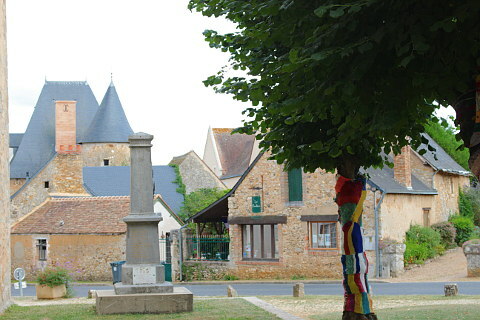 Sainte-Suzanne is nearby and is classed as "one of the most beautiful villages of France."